The Star Trek Starships Best Of Figure #9 U.S.S. Enterprise NCC-1701B Vehicle comes in window-box packaging. The Star Trek Starships Best Of Figure #9 U.S.S. 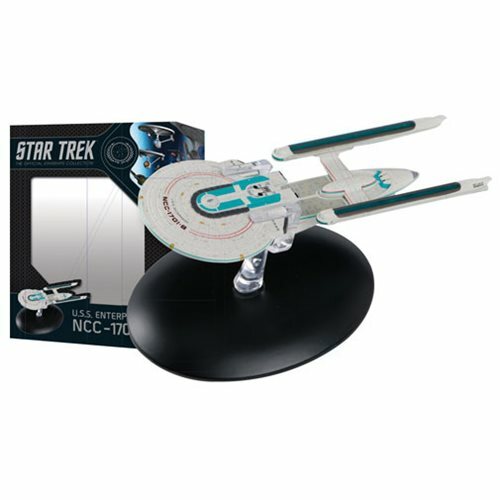 Enterprise NCC-1701B die-cast vehicle comes with an authoritatively researched 20-page illustrated magazine providing an in-depth profile of the U.S.S. Enterprise NCC-1701B. The box packaging also features a retractable J-hook for easy peggable display. Ages 14 and up. Star Trek Starships Best Of #3 U.S.S. Enterprise NX-01 Veh.